COLUMBIA, S.C. - In partnership with Midlands Gives and Central Carolina Community Foundation, the Columbia Fireflies helped raise $9,000 dollars for 48 different non-profit organizations that participated in the team's annual 'Pack the Park for Midlands Gives' fundraising initiative on August 7. The event allows each non-profit to individually sell tickets in a collective effort to raise money and awareness for their organizations. Each non-profit receives a percentage of the money from their tickets sales; the Fireflies also donate extra money to the top three selling non-profits. 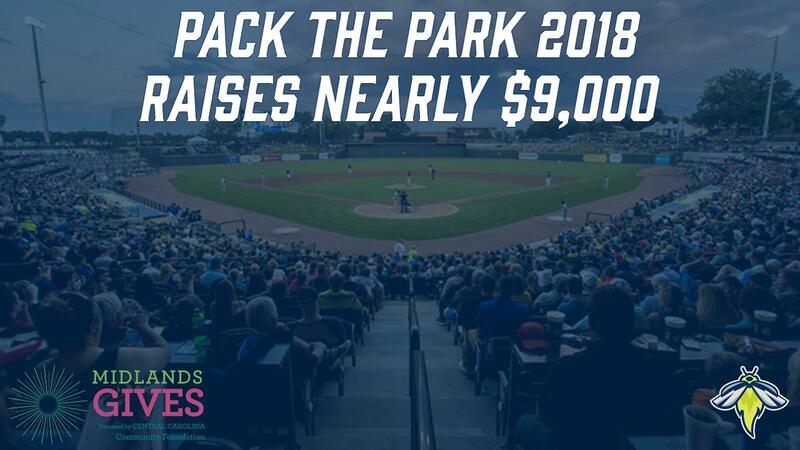 "Pack the Park is a great annual opportunity for us to support numerous non-profits from our local community all in one day," said Fireflies Team President John Katz. "We are very excited to be donating a record amount of $9,000 back to the non-profits who participated in the event this season." In its third season Pack the Park set a record of total tickets sold and in turn, money being donated back. With nearly 1,700 tickets sold by non-profits for the event, $9,000.00 has been donated back to the non-profits this year. Family Promise of the Midlands was the non-profit that raised the most money in 2018 and set a record for number of tickets sold by an individual non-profit. "It has been an amazing experience working with the Central Carolina Community Foundation on Pack the Park since our inaugural season," said Fireflies Marketing/Client Services Manager Ashlie DeCarlo. "It's been incredible watching the event's growth and we can't wait to break those records again next season. Event sales have more than doubled since the kickoff in 2016." For more information on fundraising programs with the Fireflies, contact 803-726-4487.